One of the nation's most respected aerospace pioneers has passed away. Distinguished research pilot and aeronautical engineer William Harvey Dana died on May 6, 2014. 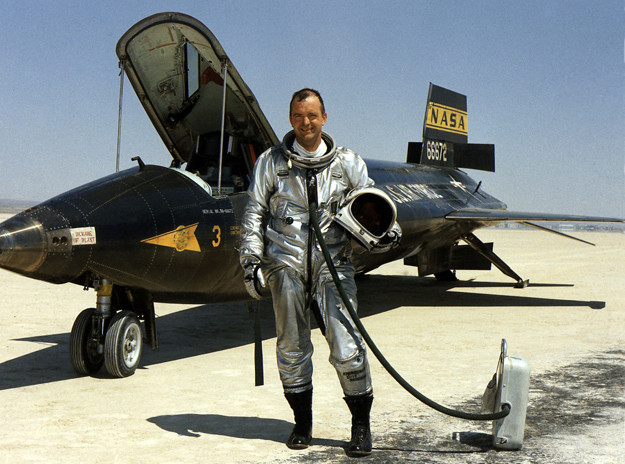 His long and illustrious career at NASA's Armstrong Flight Research Center spanned more than 48 years, during which Dana logged more than 8,000 hours in over 60 different aircraft from helicopters and sailplanes to the hypersonic X-15. Several of the airplanes he flew are displayed at the National Air and Space Museum in Washington, D.C. Following four years in the Air Force, Dana was hired as an aeronautical research engineer at the NASA High-Speed Flight Station (now Armstrong Flight Research Center) on Oct. 1, 1958, the very same day that NASA was established. His first assignments included development of a rudimentary performance simulator for the X-15 rocket plane and stability and control research involving the F-107A fighter prototype. In September 1959 he transferred to the Flight Operations Branch as a research pilot. Over the next three decades he conducted flight experiments in a wide variety of aircraft including the rocket powered X-15 and wingless lifting bodies. Dana flew to the edge of space in the X-15, attaining a maximum speed of Mach 5.53 (3,897 mph) and a maximum altitude of 306,900 feet (nearly 59 miles). He was then assigned to fly the HL-10, M2-F3, and X-24B lifting bodies to validate engineers' assertions that such vehicles could be precisely controlled during approach and landing, and providing NASA with the confidence needed to proceed with designs for the Space Shuttle orbiter. In addition he flew hundreds of research flights in advanced jet fighters including the F-14, F-15, F-16, and YF-17.He performed a guest pilot evaluation of the X-29 forward-swept-wing technology demonstrator and flew the pioneering F-18 High Alpha Research Vehicle, the first aircraft to use multi-axis thrust vectoring for vehicle control.Because of his demonstrated leadership and extraordinary service in flight research, Dana was appointed chief pilot in 1986 with responsibility for recruiting, developing and training Armstrong's cadre of research pilots. He was also assistant chief of the Flight Operations Division. In 1993, he retired from flying to become Armstrong's chief engineer. In this position, he oversaw all of the center's research projects and was responsible for flight safety. Dana held this position until his retirement from civil service in May 1998.He returned to Armstrong seven months later as a contractor with Analytical Services and Materials, Inc., to write analytical histories of various programs and to evaluate lessons learned. During a period of budget reductions, he gave up his salary and continued to work as a volunteer with the History Office. Dana was born in Pasadena, Calif., on Nov. 3, 1930, and raised in Bakersfield. His numerous awards and honors include the AIAA Haley Space Flight Award (1976), NASA Exceptional Service Medal (1976), Lancaster Aerospace Walk of Honor (1993), NASA Distinguished Service Medal (1997) and the Milton O. Thompson Lifetime Achievement Award (2000). He was honored in the "Salute to Test Pilots" at the Experimental Aircraft Association's Annual Convention in 1996. Dana was awarded astronaut wings on Aug. 23, 2005, for two of his X-15 flights that exceeded 50 miles altitude. That honor came nearly 40 years after the flights themselves because at the time of the X-15 program, NASA did not confer astronaut wings on its pilots. Dana was a distinguished member of the Society of Experimental Test Pilots. He joined the SETP in 1961 and was elected a fellow in 1998.